Game theory is the science of strategy. It attempts to determine mathematically and logically the actions that players should take to secure the best outcomes for themselves in a wide array of games. 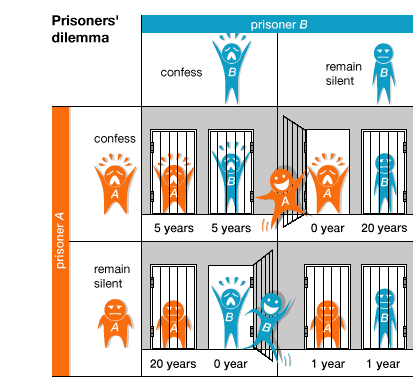 Prisoner’s Dilemma is the oldest and most studied model in game theory. We are currently charging you with trespassing, which implies a one month jail sentence. I know you were planning on robbing the store, but right now I cannot prove it – I need your testimony. In exchange for your cooperation, I will dismiss your trespassing charge, and your partner will be charged to the fullest extent of the law; a twelve month jail sentence. I am offering your partner the same deal. If both of you confess, your individual testimony is no longer as valuable, and your jail sentence will be eight months each. Let us assume the 2 thieves are Andy and Bob. I have captured all the 4 outcomes in a tabular format. Make sure you really understand the contents of the table. Let us now take a look at how Andy will think about this situation. He will clearly see that Bob can either be quiet or confess. If Bob is quiet then Andy has the following options. For deciding between the 2 choices Andy will only look at number of months he will go to jail and not care about how many months Bob will be in jail. Hence I have put a ? for Bob. If Andy is quiet then he will go to jail for 1 month. This is represented by -1. If Andy confesses then he will be set free. This is represented by 0. Since 0 > -1 Andy will confess. If Bob confess then Andy will have the following options. If Andy is quiet then he will go to jail for 12 months. This is represented by -12. If Andy confesses then he will go to jail for 8 months. This is represented by -8. Since -8 > -12 Andy will confess. Hence in both the cases Andy will confess as his outcome is better if he confesses. Let us now take a look at how Bob will think about this situation. He will clearly see that Andy can either be quiet or confess. If Andy is quiet then Bob has the following options. If Bob is quiet then he will go to jail for 1 month. This is represented by -1. If Bob confesses then he will be set free. This is represented by 0. Since 0 > -1 Bob will confess. If Andy confess then Bob will have the following options. If Bob is quiet then he will go to jail for 12 months. This is represented by -12. If Bob confesses then he will go to jail for 8 months. This is represented by -8. Since -8 > -12 Bob will confess. Hence in both the cases Bob will confess as his outcome is better if he confesses. Hence both Andy and Bob will confess and will go to jail for 8 months. If both of them cooperated and kept quiet then they would have been in jail for only 1 month. This is known as prisoner’s dilemma. Two individuals acting in their own best interest pursue a course of action that does not result in the ideal outcome. The typical prisoner’s dilemma is set up in such a way that both parties choose to protect themselves at the expense of the other participant. As a result of following a purely logical thought process to help oneself, both participants find themselves in a worse state than if they had cooperated with each other in the decision-making process. The image given below should summarize the whole concept. Watch the video which explains this concept in detail. Let us look at some real life examples. I came across this article on how Coca-Cola and Pepsi will decide on their pricing strategy. I have represented this information in a tabular format. Because of prisoner’s dilemma both of them will reduce the price and it will result in worst outcome for both of them. In the 1985 letter to shareholders Buffett explains how prisoner’s dilemma affects the textile business. India and Pakistan are considering to develop a new military technology. For this they need to manufacture weapons. Manufacturing weapons is expensive but provides greater security against each other. Both these countries have 2 choices; either to build or not to build (pass). I have constructed the payoff’s for each of the scenario in a tabular format. Because of prisoner’s dilemma both of them will manufacture weapons and it will result in worst outcome for both of them. That was extremely insightful. I could not understand the build and pass matrix in the weapon manufacturing example you mentioned. Could you kindly elaborate it a little further ?